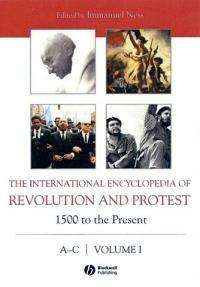 This definitive 8-volume Encyclopedia is a comprehensive print and electronic resource covering the history of protest and revolution over the past 500 years – throughout the modern era of mass movements. From the rebellion against the Peasant's Revolt in Bolivia to the Taiping Uprising in China, and from the Enlightenment-inspired revolutions in Europe and America to the anti-colonial revolts of Pancho Villa and the Mau Mau, it covers every major revolution that has altered societies or changed the course of history on a local, regional, national, and international scale. It presents major uprisings and protest movements, and the ideas, ideologies, and activists that propelled them, chronicles the manner in which they unfolded, traces their roots, goals, tactics, and influence, and evaluates their successes and failures. "Ness… has assembled a team of contributors from around the world to work on what may easily become the definitive reference on the topic of protest… The exhaustive nature and truly impressive scope of this set make it a valuable research tool for scholars. Those who opt for the e-version will benefit from regular revisions and new entries added annually, links to other online resources, and open URL linking."